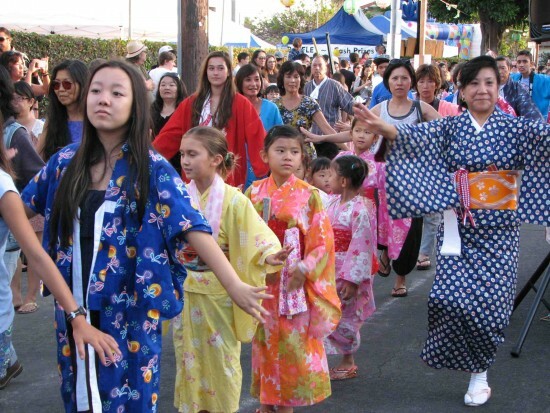 West Los Angeles Buddhist Temple presents the 67th annual Obon Festival on Saturday, July 25, from 4 to 10 p.m. and Sunday, July 26, from 3 to 9 p.m.
West L.A. Taiko performs at 5:30 p.m. and Obon dancing starts at 6:30 p.m. both days. The dances will include “Bon Odori Uta,” “Ei Ja Nai Ka” (new), “Ashibinaa,” “Bambutsu no Tsunagari,” “Tohoku Ondo,” “Sekai Heiwa Ondo,” “Shin Goshu Ondo,” and “Hanagasa Ondo.” Visit www.mustlovejapan.com/category/hwt/dbo/ to learn about the dances and see video tutorials. The festival will also feature games, a raffle, udon, beef and chicken teriyaki, won ton, Imagawa yaki, and much more. Free covered parking at the Trident Center, Corinth Avenue and Olympic Boulevard. The temple is located at 2003 Corinth Ave. in Los Angeles. For more information, call (310) 477-7274 or visit www.wlabt.org or www.facebook.com/wlabt.